‘Song to the Front’ by Vietnamese artist, Nguyen Trinh Thi takes a historical Vietnamese war film from 1973 as its central source. 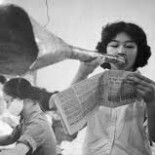 Re-editing ‘Bai ca rat ran (Song to the Front)’, produced by the Vietnam Feature Film Studio and directed by Tran Dac, Trinh Thi has turned this rarely seen black and white classic feature into a small vignette that decomposes the aesthetic and romantic elements of this social-realist melodrama. Trinh Thi extrapolates the central narrative of the film into a 5-minute abstraction, her jump cuts and use of still frames are heightened with her use of Stravinsky’s ‘The Rite of Spring’. This climactic music refers to a sacred pagan ritual in pre-Christian Russia where a young girl dances herself to death – a vision that Stravinsky claimed was to propitiate the god of Spring. For Trinh Thi, these young soldiers who gave their lives for their country are the sacrificed pagans.Trinh Thi’s version of ‘Song to the Front’ plays with the original plot line in a deliberately ambiguous manner, desiring an imaginative space for the viewer to reinterpret what were intended to be very literal epics that enforce an ideological view. Nguyen Trinh Thi is an artist, filmmaker and documentarian based in Hanoi, Vietnam. Her diverse practice has consistently investigated the role of memory in the necessary unveiling of hidden, displaced or misinterpreted histories, often making use of original documentary footage or undertaking extensive investigative field work. Trinh Thi is founder of DOCLAB in Hanoi (www.hanoidoclab.org), an independent centre for documentary film and video art. She is also an ‘Asian Public Intellectual’ Fellow (2011-2012), currently undertaking research in Japan and Thailand. Her work has been exhibited in film festival and exhibition across Asia, Europe and the USA.